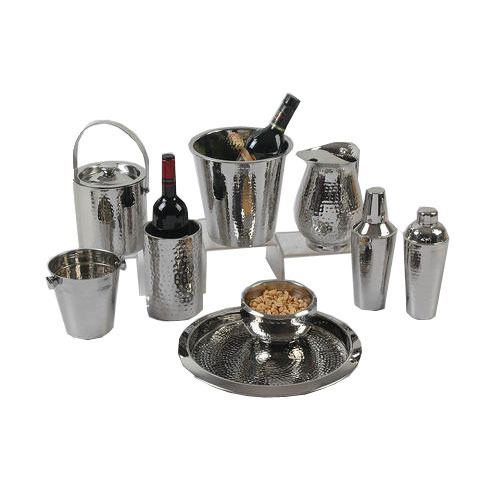 We hold an expertise in offering a wide of range products such as Bar Sets. These bar set are planned in agreeability with the worldwide quality principles and are accessible at moderate rates. Owing to the meek highlights of this influence, like luxurious look, scratch and stain safe, our item range is generally requested amongst the clients. Years of experience in Stainless Steel Industry and passion for serving the world with the top class products made Preshaa Exports, The most renowned exporter headquartered at Moradabad (India). We started with an international vision & the sole intention of being exporter of high-quality stainless steel products such as Kitchenware, Table Ware, and Barware for household & hotel were around the globe with our forte in world’s most quality conscious markets such as United States, Europe. Our specialized manufacturing capabilities with the world class production unit and a dedicated team is designed to provide high quality & designer products to our quality conscious buyers by being attentively present during the complete production life cycle, right from the stage of identifying requirements & designing the new product designs to final Timely & Qualitative deliveries. We have forayed majorly into the above-mentioned product categories but are not limited to these, we are ready to develop & design products as per our client requirements to serve our clients most effectively.